Nearly 50 years ago, the government introduced the phrase “speed kills” to warn drivers that going too fast from point A to point B could result in a detour to point C (the police station), point D (the hospital) or point E (the morgue). It was good advice then, and it’s still good advice now. The word “bouncy” has a happy and positive feel to it, while the word “sticky”…well, it doesn’t. Nobody shows up to a birthday party excited to jump around in the sticky castle, and swimming pool diving boards wouldn’t be doing their job if people stuck to them (although it would be kind of hilarious). But when it comes to websites, sticky is glorious and bouncy is dreadful — and that’s where speed makes a massive difference. A study by Kissmetrics found that a one second delay in load time can send conversion rates plunging by seven percent! Think about that. Actually, don’t think about that. Just read this sentence. That took a whopping two (!) seconds. Macabre humor aside, the point is simple to understand: for most (if not all) of their keywords, businesses either need to be on page one of Google — and preferably in the top three positions — or they might as well be advertising in the Yellow Pages (ask your grandparents). Once again, speed is a big part of the SEO story. Google — which is obsessively secretive about how its algorithm works (the first rule of Google Search Club is that you don’t talk about Google Search Club) —has actually gone ahead and formally confirmed that page speed is a significant SEO ranking factor for mobile and desktop searches. The moral to this story? All else being equal, a website that loads faster will rank higher than a website that loads relatively slower. And in the long-run that could mean the difference between surviving or shutting down. Imagine that your favorite football team is losing a very important game. It’s late in the fourth quarter, and your beloved team is behind by six points. Although the clock is ticking down one second at a time, in your view the time is racing by. Surely, the clock must be rigged! Now, imagine that your team is ahead vs. behind. The clock is still ticking down one second a time, but to you it’s not racing — it’s grinding slowly and painfully. Yet again: the clock must be rigged! What this simple example demonstrates is what psychologists dub the perception of speed. Essentially, this means that our emotions influence how we grasp the velocity of passing time. Just a few seconds can seem like the “blink of an eye,” or a tedious wait — as we all know from toiling at the (not-so) express line in the grocery store. 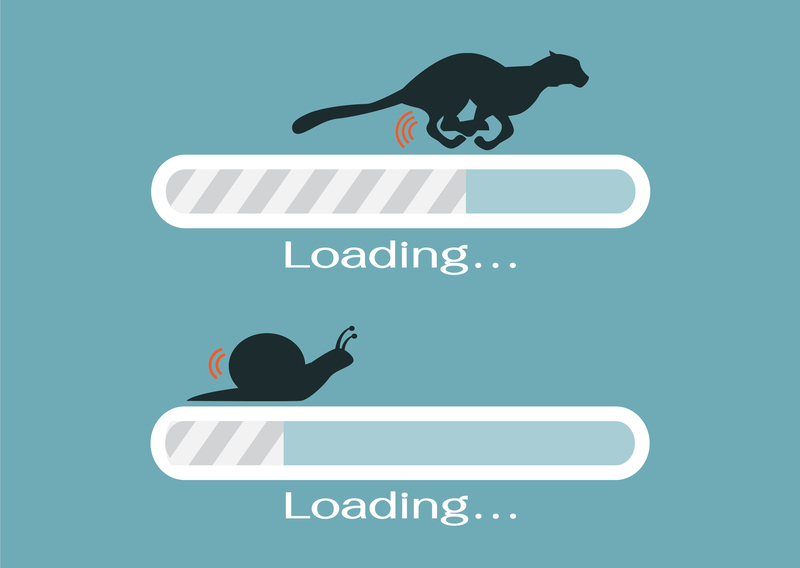 The direct link to website speed here is unmistakable: visitors dislike waiting for websites to load. Actually, they hate it. Each extra second exponentially adds to their unhappiness, and makes it more likely that they’ll exact revenge by smacking the back button on their browser — never to return. No, this doesn’t mean that websites must load instantaneously, like flipping channels on a TV. Technology isn’t there yet, and visitors aren’t unreasonable or unrealistic. But yes, it does mean that speed is connected UX, and ultimately, with brand: fast loading times creative a positive experience and emotions that are associated with the brand, while slow loading times do the opposite. Website speed has always been important. But these days, it’s crucial — and in many cases, it’s THE MOST IMPORTANT factor. After all, it really doesn’t matter how amazing a website is and what it offers, if visitors never get there in the first place.